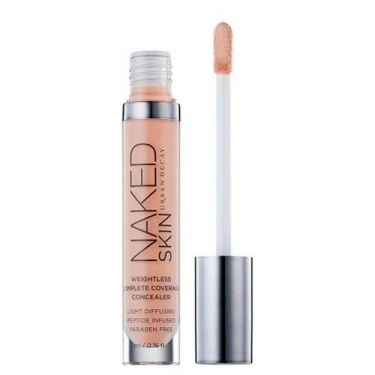 DESCRIPTION: Mini Naked Skin Concealer from Urban Decay is an adjustable hedge trimmer to create a semi-matt luminous finish. This light formula easily applies to give a second skin with a high coverage in an instant. It hides lines and wrinkles and softens the face. Enriched with Matrixial 3000 technology to reduce the appearance of wrinkles and Hyaluronic Filling Spheres to minimize the appearance of fine lines and promote skin hydration. The lychee derivative protects your skin against dehydration for a smoother, brighter appearance. Safe to use in the eye contour. Apply on face in imperfections or lines.